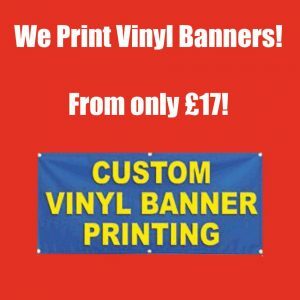 We specialise in low cost printing of custom vinyl banner signs and roller banner stands. We offer a design service or you can provide your own artwork (we can let you know the artwork requirements). We offer a speedy turnaround and all our printing is carried out at our shop in Barry near Cardiff in South Wales. To place an order just get in touch or order online below. We will be in touch asap to discuss your design requirements.